Author: Rani Polak, M.D. ; Format: Hardcover; ISBN: 9780982293973; Publisher: Imagine Publishing; Release Date: May 2013; Length: 256 pages. Condition: Like New. Dust jacket shows some minor imperfection. Cover, binding, and pages are all in pristine shape. Same cover design as that shown here. Sound the alarm: there's a health emergency, much of it caused by today's fast-food, carbohydrate-crammed, and sweets-filled diet. More and more people--even very young children--are being diagnosed with diabetes. Fortunately there's a solution: sufferers can live longer, healthier lives just by changing the way they eat--and that's surprisingly easy with "Doctor Chef" Rani Polak's groundbreaking cookbook. 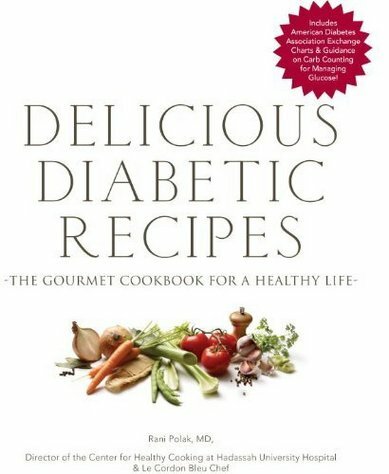 It's like a Joy of Cooking for diabetics, with superb recipes even gourmets will savor. With these dishes, there's no compromising on either taste or health. From Roast Sirloin with Mediterranean Mushroom Sauce to Fresh Melon Salad with Plum Granita and Mint, the whole family will happily dig in and no one will feel they are eating diet food. Stunningly illustrated in classic cookbook style, and all in color, this is the one cookbook you'll want if you have a diabetic in the family. And with these mouthwatering recipes that could be served in any great restaurant, it can be used as the healthy family cookbook. Bonus: Smart cooking techniques, advice on using spices, food suggestions for diabetic kids, complete family meals, and even tasty pastas and yummy desserts--so no one need ever feel deprived. Plus, this has the current American Diabetes Association Exchange Charts and the lowdown on carb counting--an important new way to manage blood glucose levels by watching the number of grams of carbohydrates in your diet, being careful about portion size, and balancing the carbs with protein and fat. These methods, together, are the best way to stay on target. Priority Mail delivery for this item costs $8.00 at the request of a buyer. Otherwise, the shipping rate given here applies to orders shipped either First Class or Media Mail (depending on product type and package size) within the U.S. only. Orders consisting of multiple purchases packaged together ship by any of these delivery methods at a discounted rate, usually for only $1.00 per additional item plus the shipping fee for the first item (determined to be the one with the highest delivery charge). International buyers: please contact us with your destination country for applicable base shipping rates. Multiple purchases that are packaged together save shipping costs for you, too!